I’ve always loved the color gray or grey, depending on how you prefer to spell it. I personally go back and forth on the regular. No matter the gray/grey, I find it to be one of the most pleasing neutrals to work with. I typically work in darker shades of gray when it comes to painting, but when I saw Annie Sloan recently came out with a new light shade of gray, my interest was instantly piqued. I’ve been combining Pure White or Old White with her dark Graphite to create lighter shades of gray for years. And don’t get me wrong, I don’t mind creating custom colors, but having a go to color straight out of the can that you love and feel like you could use on almost any piece really simplifies the process. I loved this retro buffet and hutch from the get go, and though it required some repairs to the veneers and shelves to achieve a smooth base, I knew it would be worth salvaging and refreshing with paint. Annie Sloan’s new Chicago Grey as described on her site, ‘…is a cool, fresh and modern grey, with a hint of blue. Suggestive of the architecture in Chicago. 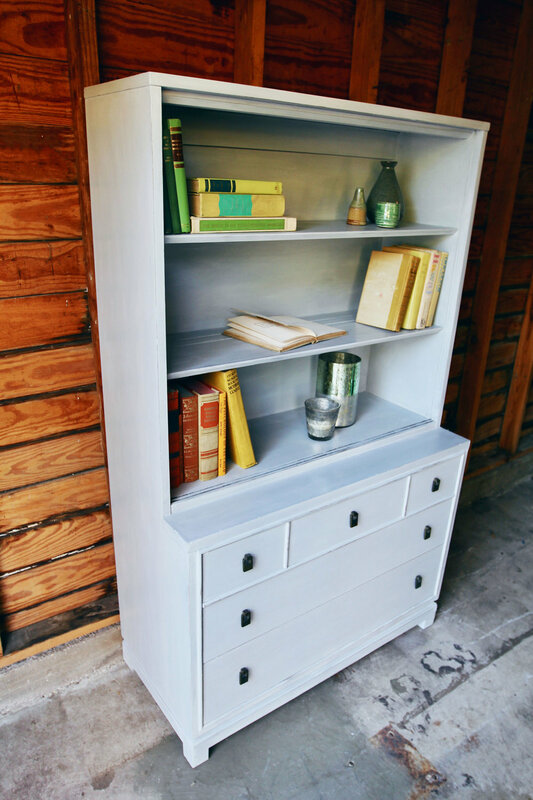 A perfect neutral for industrial interiors, or muted Scandinavian styling.’ The description fit this piece of furniture seamlessly, so I knew it was the color to go with when I was shopping for paint. Painting this piece wasn’t too difficult, with the exception of the bookcase shelves, since those are always my least favorite to work with [all those sides and edges! ], but the gray went on fluidly and solidly from the get go. Styling this piece was a breeze. The light, neutral backdrop of the gray was begging to be styled with colorful books and simple objects. I simply pulled a few stacks of my vintage books from their shelf in my home. I keep them all organized by color, since it makes it easier to visualize what colors I’d like to use for styling projects. The modern lines combined with the vintage colors and textures in the books is a perfect contrast and one I love to implement time and again. Check out more photos of this beautiful piece below and keep an eye out on my shop page, since I’ll have it up for sale soon!